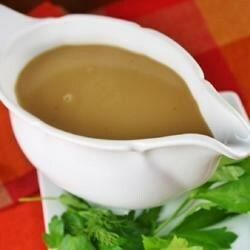 "Make an easy homemade gravy out of chicken stock, heavy cream, butter, and flour." Melt butter in a saucepan over medium-low heat. Whisk in flour until fragrant, 10 to 12 minutes. Gradually whisk in cold stock. Reduce heat to low. Bring gravy to a simmer, and cook and stir until thick enough to coat the back of a spoon, 10 to 15 minutes. Stir in heavy cream, and season with salt, white pepper, and cayenne pepper. This recipe was delicious. I used half and half instead of heavy cream because I didn't have any.